This week I've been finding sprouts of oregano in places I didn't plant oregano. This is just one more benefit of taking care of the bees. The pruning rule is that once a sprig of oregano is 6" long, it should be cut back to the ground. This keeps the new growth coming. However, oregano left to grow makes lovely clusters of flowers that the bees seem to love. 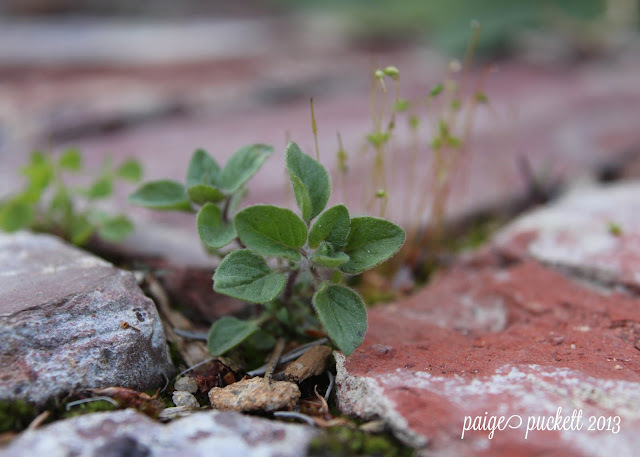 Last year, I let it grow out, blossom and seed, and now little oregano seedlings have sprouted up everywhere. Any local friends who are looking to start an herb garden should come see me before buying plants. I'll hook you up! So my oregano is almost a 3' clump, and it's only the beginning of spring! I planted it in the middle of summer last year, and I've never pruned it and it's never flowered. Would you advise that I prune it now all the way back to the ground and just leave a center clump of greenery so it can photosynthesize, or what? I wonder if there are some varieties that simply never bloom?